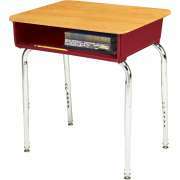 The right student desks can make all the difference in a classroom. What kinds of school desks are there? 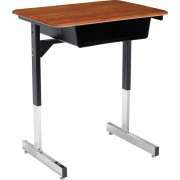 There are combo desks and classic models in many different styles. Add diversity and creativity to your school with our exclusive Innovation, Inspiration, Illustration and Educational Edge classroom desks. 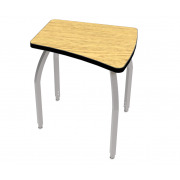 With a variety of bases, finishes and accessories, you&apos;ll find the best types school desks for your classrooms at Hertz furniture. 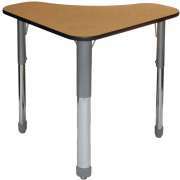 Our wide selection is sure to include a number of great options for your learning space. 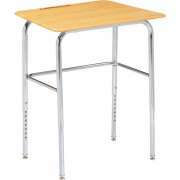 When you buy student desks from Hertz Furniture, you know you are getting the best in both quality and convenience. 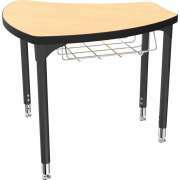 What is the most important thing to consider when purchasing a school desk? 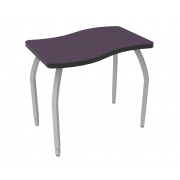 The most important consideration when purchasing school desks should be the work surface material. This key feature determines how long your desk will last and how it will look throughout the years. 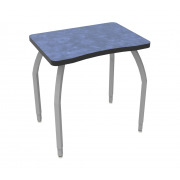 While laminate desktops are the most budget-friendly option and they do offer basic damage resistance, they do not have the durability of WoodStone or hard plastic. Hard plastic is scratch- and stain-resistant, and maintains an attractive appearance through many years of use. WoodStone offers the toughness of hard plastic but at a lighter weight and better price. Although the classic rectangular top is great, innovative work surface shapes offer other excellent options. 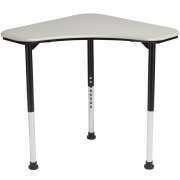 Petal classroom desks work well individually or arranged in collaborative clusters of six. They are the perfect shape for creating a learning circle. Their large desktops give students plenty of room to work. 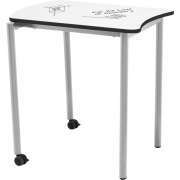 What kind of student desk is best for a flexible classroom? If you are looking for a shape that is great for smaller clusters, the Innovation series is an excellent option. Although rectangular desks can be arranged in groups, it is harder for students to see each other when they are facing one particular direction. When Innovation desks are arranged in a cluster, all students face the middle, making it easier for them to see each other and collaborate on group work. They work well in clusters of two or four. 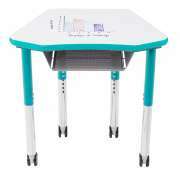 If you are looking to save space in the classroom, two-student desks are the way to go. They provide ample space for individual students and are conducive to work in pairs. The double desk from Allied Plastics features a double-tier bookbox between the two sides for accessible storage. We also have double desks without a bookbox in between. 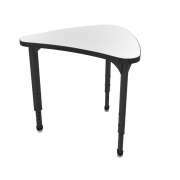 What features should you look for in a classroom desk? Whichever desk configuration you choose, there are a number of features that are always convenient to have. 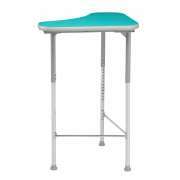 Adjustable-height desks are especially useful if your school caters to students of various ages and sizes. 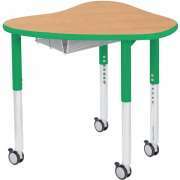 Rather than having to make sure that you have appropriately-sized desks for each grade, you can simply modify desk heights as needed. Another great option is the U-brace. This bit of added reinforcement makes desks super sturdy. 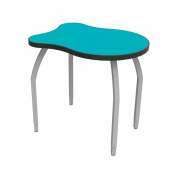 School desks don&apos;t have to be bland and boring. We offer a number of different options that will brighten up your classroom. The Inspiration and Educational Edge2 lines feature colored bookboxes that are available in a choice of vibrant hues. 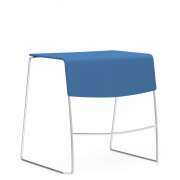 If you just want a colored accent, Educational Edge student desks feature bright edge banding in a choice of attractive colors. 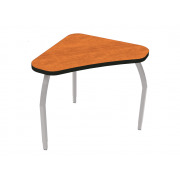 For a fun twist, petal desks are available with colored edge banding and leg uppers to brighten up your classroom. 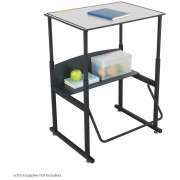 What is the best place for student desk storage? It is important for students to have an appropriate place to put materials that are needed for class. Book boxes are a great remedy for cluttered desktops. Rather than students stacking all classroom materials in front of them, writing surfaces stay clear with only necessary materials on top and the rest inside the bookbox. Book boxes come in a number of different styles. 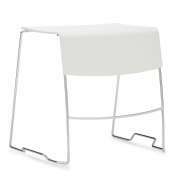 The classic open-front style provides students with easy access and keeps contents hidden. If you are concerned about students playing inside their desks during lessons, lift-lid book boxes keep materials close at hand while preventing students from fiddling inside. If you want to monitor desk contents, open view book boxes offer full visibility. 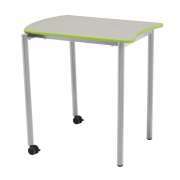 Hertz Furniture&apos;s huge selection of student desks includes a number of great styles and models for students of any age. With so many options to choose from and a lot of factors to consider, it&apos;s easy to get overwhelmed. If you need help choosing the best model for your school, don&apos;t hesitate to call the Hertz Design Center for free project planning advice.